ICV has been working with Coobabla Farm communit since 2009. Like many other farms in rural areas, Coobabla relies heavily on rainfall for its water supply. WWLAC wanted a skilled volunteer to work alongside local men to build two kit sheds on the farm. This would improve construction skills in the community and significantly increase rainfall catchment on the farm. Volunteer Robert was the perfect match. A qualified mechanical engineer and retired technical teacher, Robert has a passion for contributing his knowledge and experience to the growth and development of others. The success of his first visit to Coobabla and the respectful relationship he built with community members has endured over the years. In 2015 the farm’s hay shed burned to the ground and with it, a large part of its rainfall catchment capacity. 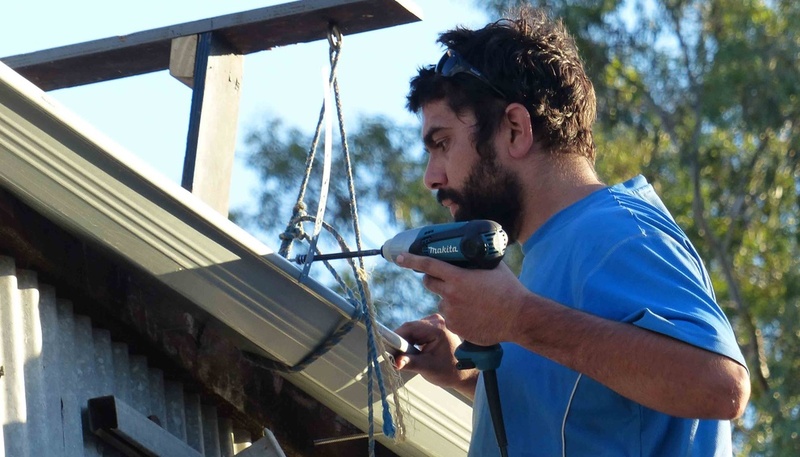 Although the shed was insured, finding the right solution for rebuilding and replacing water collection and storage infrastructure within their budget was a challenge. WWLAC got in touch with ICV again to see if Robert would be willing and able to return to Coobabla and support the community. WWLAC Elder, Dennis Hayward, invited Robert back to Coobabla Farm to view the proposed hay shed site. They visited a local shed manufacturer and the Northam Shire Council to discuss the project with the Planning Officer and Building Inspector. Following Robert’s advice, WWLAC finalised a contract for the complete supply, delivery and erection of their new hay shed. During his visit, Robert found that one of the community’s biggest concerns was around rain water catchment for drinking and household use. He identified that a system of improved gutters and minor modifications on existing structures would greatly improve their water catchment and avoid the need to purchase drinking water. Robert spent the following week working with farm residents to reinstate the rainwater catchment facilities of several existing roof areas.